The ultimate guide to Google AdWords is fully updated for its third edition This is the ultimate guide for those who want to quickly get beyond AdWords basics to learn and apply the advanced techniques and tactics that are used by Fortune 500 companies. The book provides insight into AdWords' functionality and advanced features, explaining how they work and providing tips, tactics, and hands-on tutorials, which readers can immediately use on their own PPC campaigns. 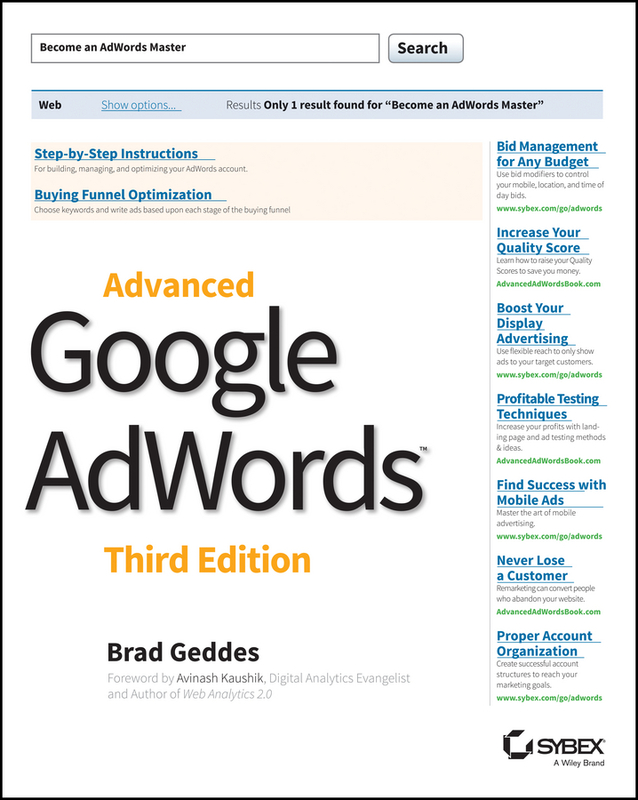 The third edition features more than 50 pages of new material and has been completely revised to cover all the changes to Google's system, including changes to the campaign structure, bid modifiers, new quality score analysis techniques, and the latest ad extension updates. Expert author Brad Geddes gives advanced insight, direction, and strategies for every aspect of using AdWords to create and manage a successful pay-per-click marketing campaign, and also shows you the best tools and techniques for keyword research, including negative keywords. In addition you'll: Discover how to craft winning ad copy, and explore advanced PPC campaign optimization techniques, including how to optimize for a good quality score Explore the intricacies of the Display Network and learn how to interpret reports Learn how to use the AdWords Editor to create thousands of keywords and ad copy configurations Understand advanced bidding strategies, and how to best organize and manage an AdWords account Learn how to best test everything from landing pages to ad copy The book concludes with detailed chapters on understanding, interpreting, and acting upon the detailed AdWords reports so you can confidently make decisions to positively impact your campaigns. Advanced Google AdWords is detailed, in-depth, and full of insights, techniques, tips, tactics, and fascinating real-world case studies, making it the ultimate step-by-step guide for developing advanced AdWords expertise.